The drip pan I’m replacing is just over nine inches in diameter. How do I know this is the pan I need. It says eight inches but mine is more like nine. Hello Rosine, if you supply us with your model number we can ensure you are ordering the correct drip bowl. I will note that the drip bowl itself is not eight inches, it is designed to work with an eight inch burner element. I hope this helps! How do I take the element off to replace the drop pan? Hi Briella, great question! Before you start this repair unplug your range and let your elements cool off. To remove the element, lift it up and gently pull it out of the terminal block. Once the element is safely out of the way you can remove the old drip bowl and simply drop the new one into place. Good luck with your repair. Hello Valerie, Thank you for your inquiry. The part number for the 8" inch burners drip pans is 316048413 and the 6" inch burner drip pans is part# 5303280336. Hope this helps! How do I know when my drip pans are beyond cleaning and just need to be replaced? Hi Ivan, thanks for your question. We recommend replacing drip bowls if they are dented or damaged. If you have tried to clean them but cannot seem to get all of the dirt and residue off you should also consider replacing them. I hope this helps. When I typed in my model number it came back as being a Frigidaire. My stove is a White Westinghouse. I am just looking for the proper drip pans. Can you help? Hello Wendy, Thanks for your question. White Westinghouse is owned by Frigidaire now, so these parts are compatible with your White Westinghouse. Part number PS459618 is the 6-inch drip pan and part number PS459618 is the 8-inch drip pan. I hope this helps. Related Parts: Drip Bowl - 6"
I need to make sure i'm getting the right drip pans for this model number stove, as none of the ones from walmart are fitting correctly. Also, are your drip pans sold as a set or do i need to add 2 of each to the cart? Thank you. Hi Lienora, Thank you for your question. The drip pans listed under your model number are sold individually. The part number listed for the 8 inch drip pan is PS437959 and for the 6 inch drip pan the part number is PS470124. I hope this helps. Thank you and have a great day! Hello Daphne, Thank you for contacting us. I have researched the model you have provided and have found the part you are looking for is Part Number: PS437595 for the larger drip pan and Part Number: PS459618 for the smaller one. Thank you for your inquiry, good luck with this repair! Could you give me the part #'s for both size drip pans for my model stove.I can only find the 8" drip pan on your site (manuf. Part 316048413)? Thank you. Hello Joan, thank you for your question. The small pan is PartSelect Number: PS470124 and the large pan is PartSelect Number: PS437595. Please enter the part number into the site for current price and availability. Good luck with your repair! Our church has older Westinghouse electric ranges. The model number is not easily readable. The best i can tell it is something like kf130mxwe but that is not recognizable in the system. 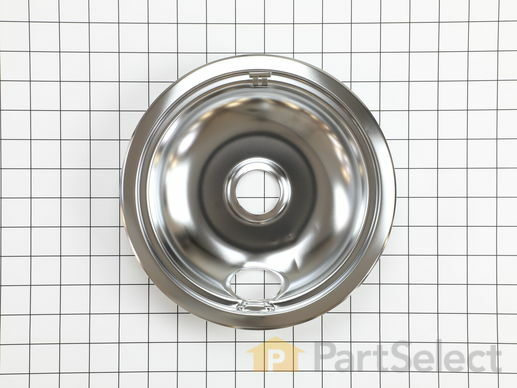 Are drip pans returnable if i order them and they don't fit? Hi Pat, Thank you for your inquiry. The part number for the 6 inch drip bowl is PS1537677 and the part number for the 8 inch drip bowl is PS1537683. I hope this helps. Thank you and have a great day! Do these come in the black or the kind that clean easy...the ones that dont stick i cant think what that kind is called but they are for easy cleaning? this is my size and i see the chrome but i sont like the chromes ones. Hi Shari, Thank you for your inquiry. To verify if you can get the drip bowl in a different color, we will need the model number from your appliance. I hope this helps. Thank you and have a great day! Excellent seller, fast shipping, fits my stove perfect! Perfect fit, easy to purchase, great customer service. I'll be back. These replacement drip pans were a perfect fit unlike the generic ones that were on the stove when we bought the house. chrome bowl fit nicely. shipping was pretty slow. it took 8 days from the day it was shipped. Correct fit, quick shipping, and very nice customer service!! The parts were delivered in great condition. The part came in good time and it fits my stove just right. Thank you.